We are two days out from starting our 100 Days with Christ Bible study for 2017. Woop! I am super excited to be doing this with YOU, and in preparation for the Easter season. Before I get to the logistics of this study, I want to share 5 keys that have helped me stay the course and finish a Bible study. Because somewhere in the middle, for lots of reasons, it gets easy to let a Bible study stay aside unfinished. I want us to cross the finish line of this full study together because God has so much for us in these four gospels. The 5 keys to Bible study success are in the form of an acrostic: CHASE. C is for Choose. If we’re going to be serious students of the Word, we need a plan. We don’t want to just let our Bibles fall open to a random passage each day. Choosing a Bible reading plan, topical study or book of the Bible study is the first step to helping us get it done. H is for Hour. Not that you need an hour but that you need to decide WHEN you’ll do Bible study. Mornings over breakfast? On a lunch break, during kids’ naps or in the evening when the house is quiet? Choose a consistent time to create a daily Bible study rhythm in your day. A is for Accountability. Find accountability with a circle of friends or an online group. Keeping pace with others helps provide momentum to get in the Word every day and to keep from stagnating or stopping altogether. We’re going to make a great accountability group! S is for Slip-ups. They WILL happen. There will be a day or two or three where life happens and Bible study doesn’t. The key is to pick back up with that day’s reading and keep moving forward. Don’t go back to missed material unless you have catch-up days or you may get perennially behind. E is for Encouragement. Or enticement. Set up an incentive for yourself like coffee made with a timer and waiting for you when you wake up. My enticement is that no other reading – including Facebook and email – can happen until Bible study gets done. 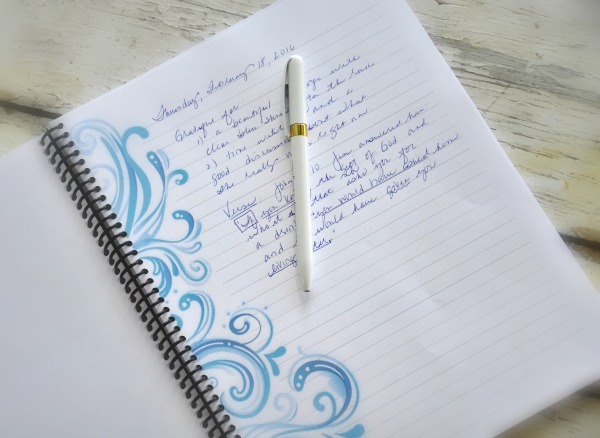 Other encouragements might be a new journaling Bible and pens or a breakfast favorite with Bible routine. Set yourself up to win AND to enjoy it! That’s it — CHASE. Because we’re going to CHASE after God like nobody’s business with ears and hearts wide open to receive all that He will teach us for 100 Days with Christ. Okay, on to the logistics and resources. We start this Sunday, January 1 and will finish up on Monday, April 10. That brings us right up to Easter which is on Sunday, April 16 (with a few grace days for catch up). Join me each Friday for a lesson from our week’s reading. This is a great way to keep on track and stay encouraged throughout the study. And it will be a place for YOU to share what YOU are learning from the study in the comments. I can’t wait to read how the gospels impact you! 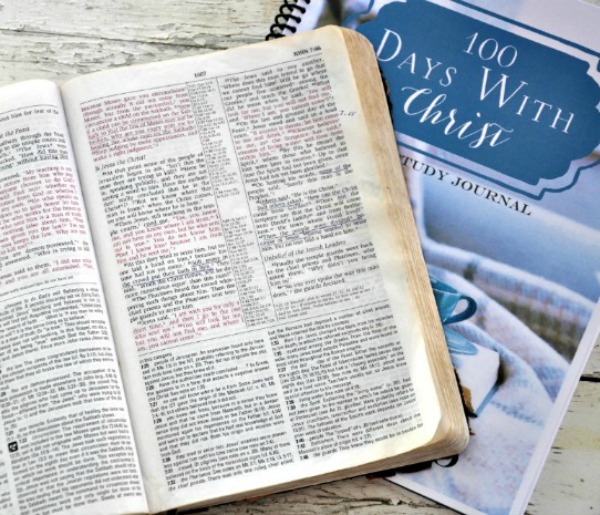 Sign up here for the free download of 100 Days with Christ Bible reading plan and journal. I highly suggest you print out a hard copy. I printed off extra journaling pages – 40 of them – because I wanted plenty of room to write and reflect, but you could also use a spiral notebook or journal. I took mine to my local copy shop and had the whole thing comb-bound for a few dollars. The Bible study has an introduction that explains how to use the reading plan. There are 100 days of reading and we’ll read each day. Some days are shorter and you can double up and some days are a bit longer but most will take about 20 minutes plus any time you want to spend in reflection and application. I suggest you go ahead and number the days of the reading plan from 1 to 100 and then check off each day’s reading as you finish. Each month, I’ll have scripture cards with key verses from our reading. 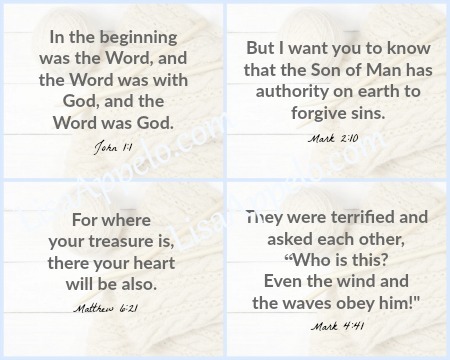 You can use these as bookmarks, post them on your mirror or fridge or keep them with you for scripture memory. Here are this month’s scripture cards. You may want to keep a chronological list of the events in Jesus’ life and ministry to help tie the people, places and His teaching together. Keeping a timeline last year really helped me connect so many dots! It’s also helpful to keep track of where Jesus traveled in his ministry. This is a free printable map of Israel during the time of Jesus’ ministry from Bible.ca. This is another great map from the Library of Congress. I’ve printed it for reference in my reading so that I won’t have to flip back and forth in my Bible. I’ll be posting some of our key verses and truths we’re learning on Instagram so be sure to follow there. 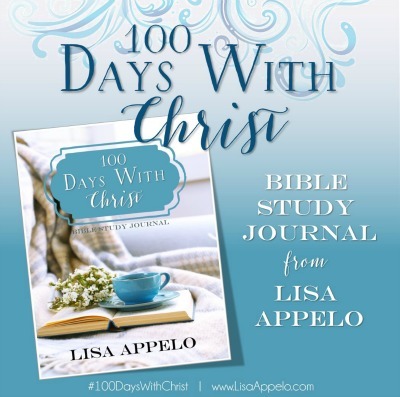 And tag your Bible study posts with #100DayswithChrist…I’d love to feature your pictures! Ive signed up but have never received the download? I just sent it to you again, Catherine. Please message me if you still don’t see it in any of your email folders. So glad you’re joining us for this study! I haven’t received it yet either. I so want one of these Bibles! I am so excited to start this study with you, I too, will be praying for you and your family. I recently finished a Bible Study and have been praying for God to show me where He wants me to study His Word, what better place than to study His life. Thank you for sharing with us. May God Bless you and your family this new year and years to come! Happy New Years! I have signed up for the study but have not received an email with a link to the study yet. Do I just need to be patient? 🙂 I am really looking forward to doing this study. It is just what I need right now! Just sent you a welcome letter with the downloadable link, Sharon! Lisa, I haven’t received the download for the study. I have not received the download yet. I signed up to receive the bible study materials a few days ago, but still have not received the email. I tried again yesterday and this morning, but nothing has come through. Maybe I’m doing something incorrectly. Looking forward to this bible study. I just sent it, Barbara. Thank you for letting me know! Lisa – Thank you! I received the email and opened the information. Looking forward to the Bible study. I have signed up twice but have it received the download. I’m excited to get started. Just heard about this study yesterday and signed up. Any chance I can still get download info today? Absolutely! You should have received the welcome email with the link to download the study but let me know if you don’t see it in your email files. I have submitted my email a few times (twice yesterday and then again this afternoon) but I have not yet received the download?? Just checked my spam – but it was not there either:( Would you mind trying to send it to me again? Thanks much…..really looking forward to this study! Thanks, in advance, for all the work and study you have put into it!! I just sent you a link, Jennifer. I’m glad you’re joining us for this! Hello. I signed up a few days ago, and again several times today, but I have yet to receive the download. Sarah, I just sent it to you. Blessings! Hi Lisa, I didn’t receive the download after sending my info twice. Excited to study with you! Thanks for your help and for your willing heart to put this together! God bless! I got it!! Thank you! I have been looking for my download and I have not received the email either. I checked my junk mail and it is not there. Could I get the email with the welcome letter and download? Just sent it out to you, Tammy. Got it!! Yay!! Thank you!! Hi Vonnie, I just sent it to you! Just sent it to you, Jodie! I sent it Stacy. It will be easy to catch up b/c the first 2 days’ reading is fairly light. I’ve signed up for your course twice and not received a response. Could you send me the appropriate link? Thank you. I just sent the welcome letter to you with the link. I’ve been late in signing up, and did it several times yesterday, 5th Jan, and twice today, 6th Jan, however, haven’t rec’d anything ,check spam, not there either. Would you send me the link please? I’m so looking forward to joining the challenge, to know the Father’s love more, and pray with and for the others too. Thank you, and God’s blessings for your leading. PS I live in Italy… praying for fellowship with sisters who are keen to know God more and more. So glad you are joining us, Giulia! I’ll send the welcome letter with link to you directly. Lisa, I know I’m really late but would love to join. I can’t download the study etc. I must’ve signed up a while ago and it’s gotten lost in the junk. Also have a friend interested. Jagette, it’s not too late! I’m sending the study to you now. Have your friend message me or email if she needs the download link also. I’m glad you’re joining us!